Video is the most powerful medium to elicit behaviour change in consumers. Whether your objective is short-term sales lift or longer-term brand building, strong video content can help encourage people to take an action to purchase or signup. 73% more visitors who watch product videos will buy, 64% of consumers will make a purchase after watching branded social videos (via Tubular insights), and 68% of YouTube users watch the channel to help make a purchase decision (Google). Marketing is now “always” on. Brands need a whole series of content to reach viewers where they are with videos that they want to watch. A stark reminder of this is that the UK has one of the highest rates of ad blocking the world with 39% of page views blocking ads. (OnAudience.com). Add the drive to beat off the competition in the attention economy, and brands have had to switch to a publishing model, where we think about how to attract people to our content, encourage them to feel something, inform them – and of course bring them back for more. As a strategy for this new wave of content to hit all the stages of the sales funnel from awareness, consideration to conversion and retention, YouTube introduced the concept of Hero, Hub and Hygiene. I’ve spoken about the HHH content strategy extensively on this blog, and here’s a video to go with it summing up these different kinds of content. Hero: as the name suggests, is the big heavy hitting content to raise brand awareness. Viewers won’t often have sought out this content, so it needs to be bold, emotional and attract the audience. This tends to have higher production values and media spend behind it. Hub: this content aims to create a dedicated audience around a passion point. These videos will build engagement, brand loyalty and bring them back for more. (Get a flavour of this kind of content by checking out our videos for Costa Coffee). Help (or Hygiene): this content offers viewers answers to their searches that start “how to…”. Help content is an effective way to raise awareness by keying into high volume search terms without a large activation budget. With the HHH formula, I would add Go (or action) content to stress the importance of using video to convert users to buy at the end of the funnel. Go (or action) content is designed to transform interest and engagement into sales conversions. If you have an engaged audience but are not reaching your sales targets it is worth considering Go content. These videos are specifically designed to encourage a viewer to take an action, whether that’s to phone or add a product to the shopping basket. Generally, these short films are positioned next to the products on a page, and in fact, they will work most effectively the closer they are to the shopping basket. 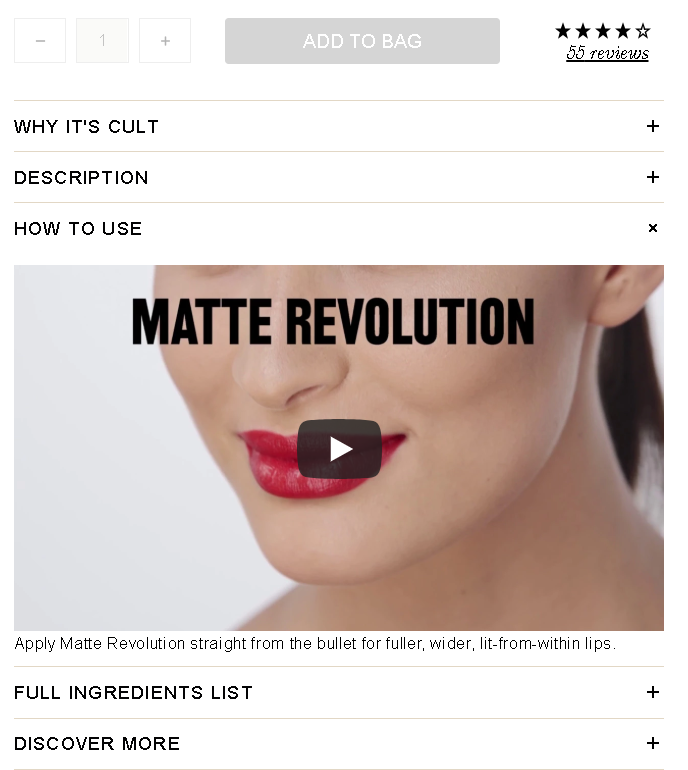 Go content is used effectively with fashion and beauty ecommerce brands. 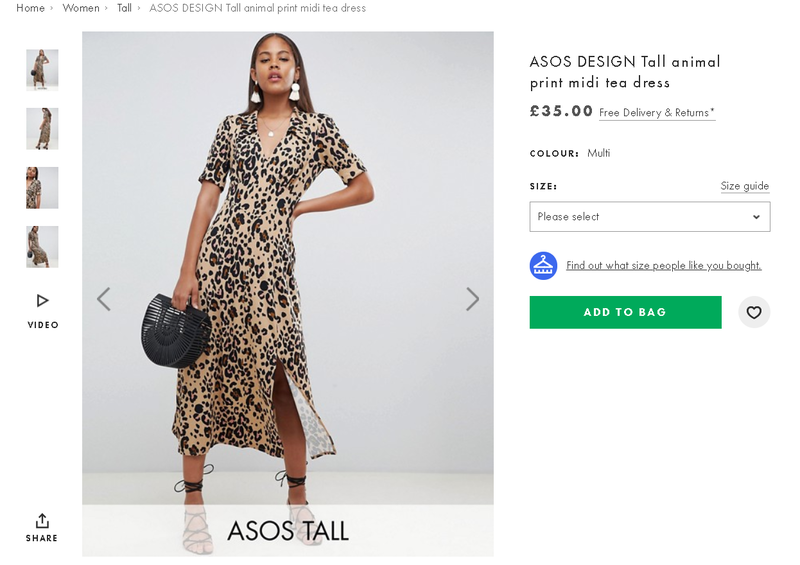 Here are two examples below from Asos and Cult Beauty. In both cases, you can see the video is strategically placed in relation to the buy button. Video is really powerful in generating a connection between the viewer and the product, building trust and tipping them to take an action. Consumers also have more understanding about what they are buying and so tend to feel happier about their purchase and less likely to return; 57% are less surprised about the products they receive after watching a video. I’d like to end with the most powerful form of ecommerce video, which I would like to see more brands experimenting with. This is a combination of go content with hero or hub – it’s where ecommerce and storytelling come together. The results are impressive; in an interactive campaign for Ted Baker, they boosted sales 32% over a 19-week campaign. Another good example comes from Dulux, which ran an interactive video as an extension of its Prohibition of Colour campaign. In a dystopian future, colour is banned, but there are people challenging it and the video invites you into their colour-filled world. The content links to Pinterest boards to inspire viewers, but also push them on to purchase. You can see the interactive video here. To conclude, don’t forget to add go content to your HHH strategy. If you need further tips, do check out my Video Marketing Strategy book – we’re currently able to offer 20% for Hurricane web visitors too.